HELIX 7 CHIRP DI G2 | HELIX 7 Series | 410280-1 ​The HELIX 7 CHIRP DI G2 with our new user interface and operating system, features a brilliant 800H x 480V, 8-bit color display with backlight. CHIRP Down Imaging and Dual Beam PLUS sonar with 4000 watts PTP power output. 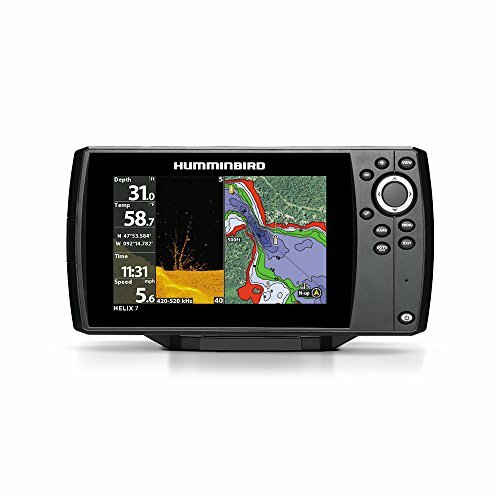 Maximize your angling experience with the Hummingbird HELIX 7 CHIRP DI G2 fish finder system. CHIRP Frequencies (Out of Box Transducer) 455 kHz: 420-520 kHz 800 kHz: 790-850 kHz Maximum Depth: 600 feet CHIRP Frequencies (Optional Purchase Transducer) Low: 28-75 kHz Med: 75-155 kHz High: 130-250 kHz 83/200: 75-155/130-250 50/200: 28-75/130-250 Maximum Depth: 2500 feet CHIRP Down Imaging Sonar w/Temp. It changed the game once. Now it's poised to do it again. The HELIX Series has evolved-with new, best-in-class technologies including standard CHIRP Digital Sonar, enhanced networking, and new MEGA Imaging for the most detailed sonar returns that anglers have ever seen. Innovation. Bold styling. Ease of use. In this family, the apple doesn't fall far from the tree.